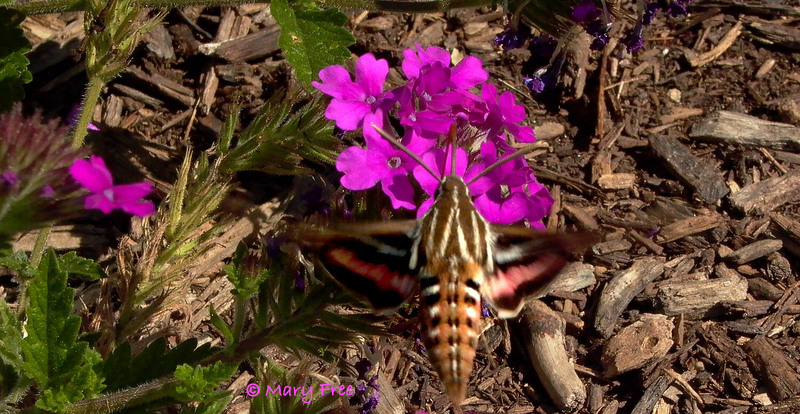 Sometimes moth species, like the white-lined sphinx (Hyles lineata) above, are mistaken for hummingbirds. Unlike most moths, it often feeds during the day. At first glance, its bulk, rapid wing movement, swift flight, and habit of hovering as it feeds resemble that of a hummingbird. No wonder these insects also are referred to as hummingbird moths. 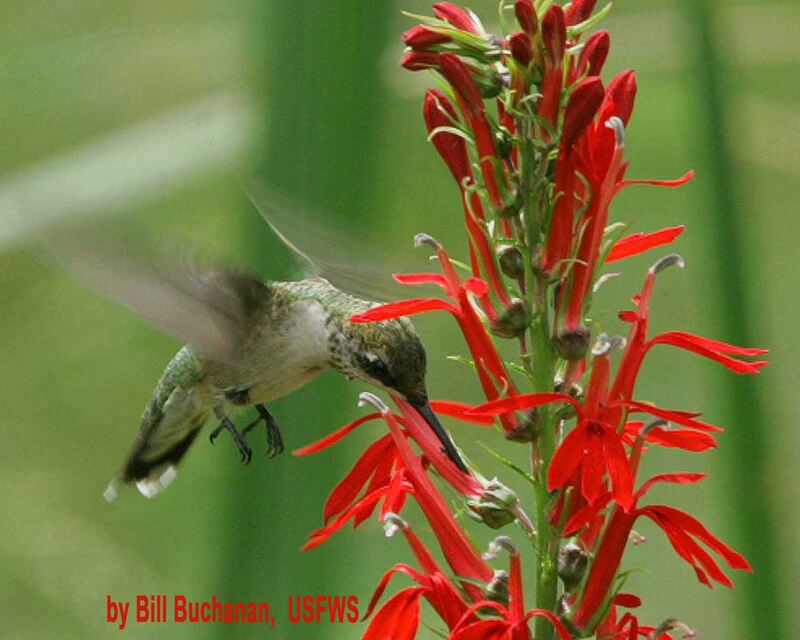 However, the only hummingbird species that breeds in eastern North America is the ruby-throated hummer (Archilochus colubris). It has an emerald green back and white breast (like the female pictured below). Only the male sports throat feathers that appear iridescent ruby red (or black depending on the light’s angle). 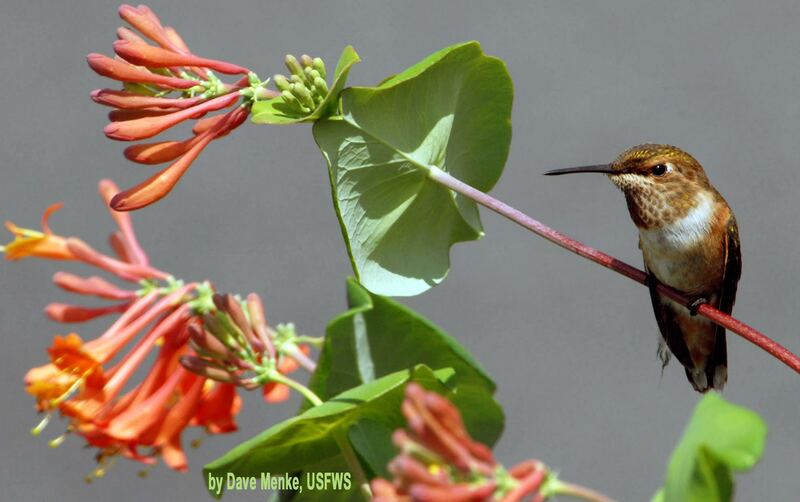 Unlike Virginia’s regular summer resident, rufous hummingbird (Selasphorus rufus, above) is a common Western species. It summers in Alaska and the Pacific Northwest and typically winters in Mexico. On occasion, a few migrate eastward in the fall and unlike the ruby-throat, a rufous can endure Fahrenheit temperatures below zero degrees. According to eBird, “… immatures that stray to the East and survive the winter are likely to return in the following year, and there are numerous records of banded birds reappearing in subsequent years.” Over a two-month period from October to December 2012, thirty rufous sightings were reported at Green Spring Gardens in Fairfax. If you decide to leave a hummingbird feeder up into winter for a stray rufous, try to keep the feeder sheltered and take it in each night to prevent the contents from freezing. This entry was posted in MG in the Garden, Pollinators and tagged Archilochus colubris, bird feeders, eBird, Green Spring Gardens, hummingbird migration, hummingbirds, Hyles lineata, Lobelia cardinalis, Lonicera sempervirens, Master Gardeners of Northern Virginia, nectar, ruby-throated hummer, rufous, rufous hummingbird, Selasphorus rufus, white-lined sphinx. Bookmark the permalink.